This morning, fairly early (ie before 9) Gerry and I took off for Ponce. Our trip was mandated by the need to pick up some vejigante masks we had ordered from our regular mask suppliers, Tomás and Madeline Vázquez. As of this year, we are using these trips on purpose to visit our suppliers and to find new suppliers: We got to do both on this trip. When we arrived in Ponce, we decided to go to the Ponce Museum of Art first, to see the exhibit “From Greco to Goya: Masterworks from the Prado” We had heard that the exhibition was small and not that good, but we weren’t meeting Tomás and Madeline until 11 so we decided to go in and to see it for ourselves. We opted to get the audio guide to illuminate us as we gazed on the art. Gerry got the guide in Spansih and said it was excellent. I got the guide in English and practically pulled my hair out! The English voice was nice enough but the poor person (woman) could not pronounce any of the names properly and it drove me crazy. She spoke the Spanish names as if she didn’t know Spanish, and the non-Spanish names suffered all kinds of butchery. It was hard to know who she was talking about at times. Even so, I still really liked the exhibit. There are some very nice works by Ruebens, Zurbarán, Cerillo, el Greco, Goya, Titian, and others. 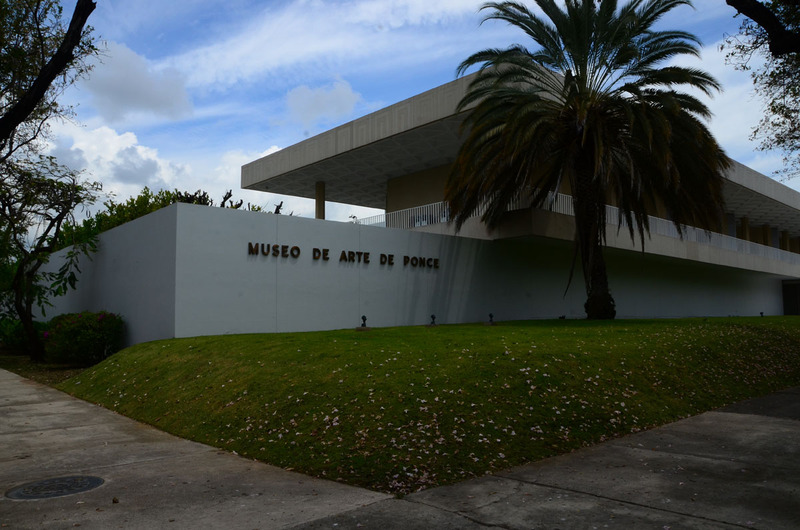 The exhibit was not very large, but pieces from the Ponce Museum’s collection are displayed in rooms adjoining those that contain the Prado works, so you can actually see what kind of quality the Ponce Museum’s collection has. It would definitely be worth a trip to Ponce to see it, and there is no reason not to see the rest of the Museum at the same time. The collection is very interesting, especially the popular “Flaming June” and the new building is wonderful. On the way out, we caught a glimpse of our resident commissioner, Pedro Pierluisi, also touring the Prado exhibit. Gerry says he greeted him…I don’t know about that. Somehow or other, it has escaped me for the last 26 years, that the Catholic University is right across the street from the museum. 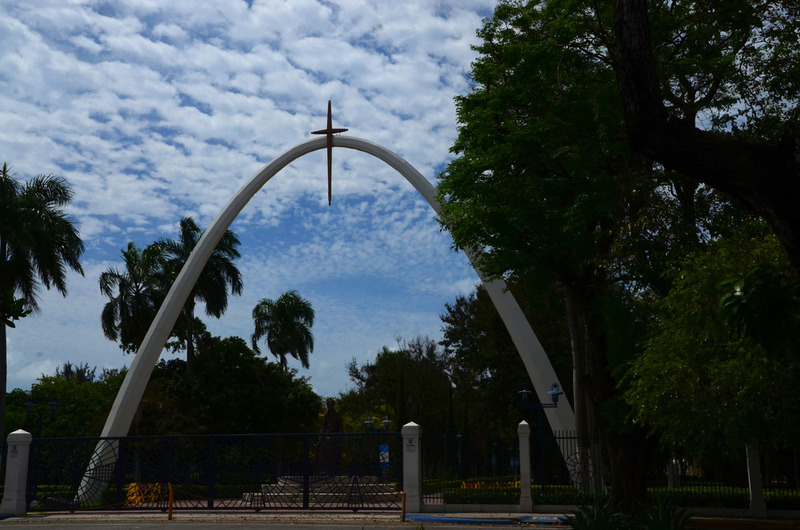 The campus was shut for Holy Week and spring break, but it looked lovely peering in through the gates. I will put it on my list for the next Ponce trip to actually go in and visit the campus. For some reason, I have this impression that the university campuses here in Puerto Rico aren’t like campuses in the States. I am wrong! After the museum, we headed off to find Madeline and Tomás. Cruising down a neighborhood street in Ponce at 10 miles an hour does raise certain suspicions, and some of the neighbors were leery of who these strange people were…but once we found the right house and got out of the car, Madeline greeted us quite warmly out on the street and the neighbors relaxed. The last time I had been to Tomás and Madeline’s house they lived in a different area altogether, in a house with several levels. My memory of that visit was of birds, pet birds. Tomás showed me all his pet birds here at the new house, too. These are tiny birds, like the ones you can purchase in pet store. The biggest ones are little parakeets. He raises them, but I wasn’t sure if he sells them to stores or not. We got to see little tiny eggs in the nests as well as tiny, tiny chicks. All of the birds are so beautiful. How I would love to add even more animals to my household…but no. I won’t. Tomás and Madeline with some masks in progress. 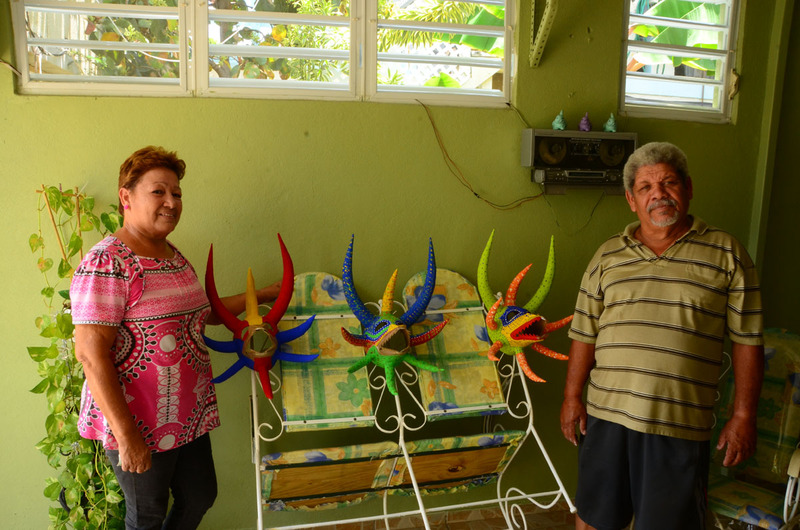 Tomás makes the masks – that is, he does the papier mache work, and Madeline does the painting. We have been buying masks from them for years (since Isla started in 1994). Since they have molds, and patterns, all our masks have the same shape, the colors vary greatly and in fun ways. This trip I spied something up on the wall that I really liked…A mask in the shape of a starfish! Madeline told me that she didn’t sell them, but we agreed that I would put them on the internet, and she would continue to make them for us if they sell. We loaded up the car with all our colorful masks and headed off to our next stop. Mr. Torres, was very gracious with us and showed us his work. Yes, we liked it! Lots of unusual shapes. 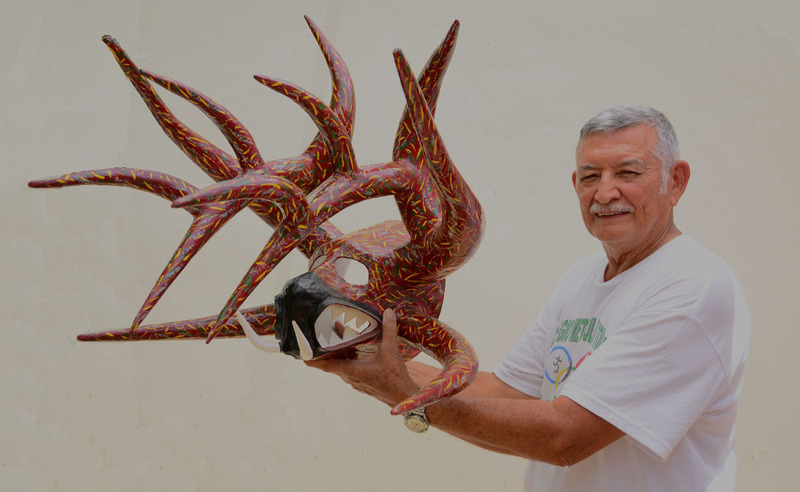 Torres makes each of his masks as a “pieza única” – one of a kind. We took pictures of the masks, but also ended up buying about four of them and bringing them back to Isla. My favorite, of course, was the huge, most expensive mask he had. I would love to get one for myself. After our meeting with him, we went back to the turbine blades and asked the guard about taking pictures of them. We couldn’t cross the fence line (the fence hadn’t been finished yet – so it was just a line of supports in the dust) but we got to shoot some pictures of them. We weren’t the only ones to stop…Another car of people also got out to gawk at the blades and talk with the guard. By this point, buying all those masks had made us pretty hungry so we went to La Ancla for lunch. The restaurant is right on the water, and our table right by the window looking out, so we had a pretty steady parade of people going out onto a nearby pier for fishing. Since this is basically a holiday week in Puerto Rico, we saw a lot of kids on spring break fishing with their parents. We also saw quite a repertoire of fishing “poles”: From the regular fishing pole (with rod and reel) to a tin can with fishing line wrapped around it…people are quite innovative when it comes to making something with which to fish. waitress didn’t tell us it was going to be too much. 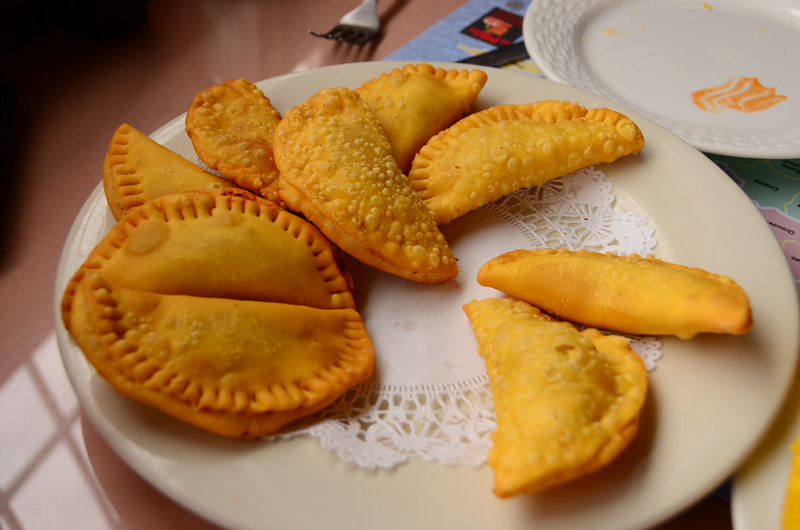 We ordered surullos (fried corn fritters with cheese inside), tostones rellenos (fried plantain cups filled with seafood) and empanadillas (fried fritters with meat) for starters. Fried, fried, fried! 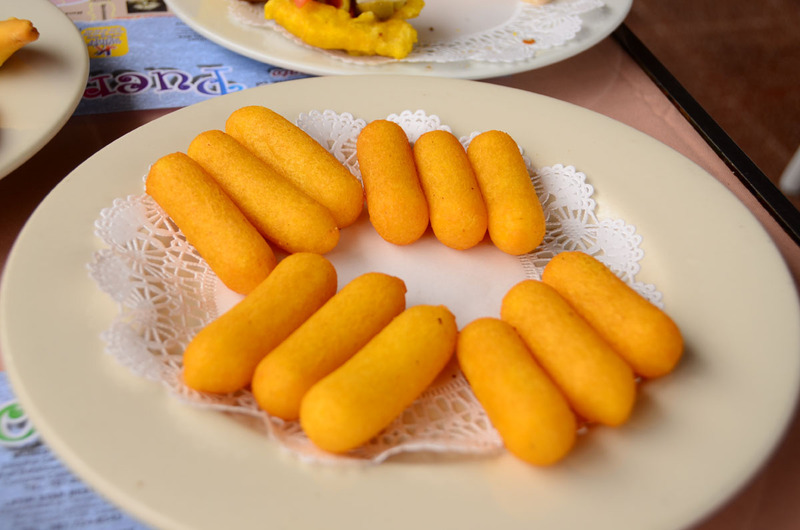 That’s the Puerto Rican diet. Each plate was more than enough for 4 people! We ate what we could and brought the rest home. 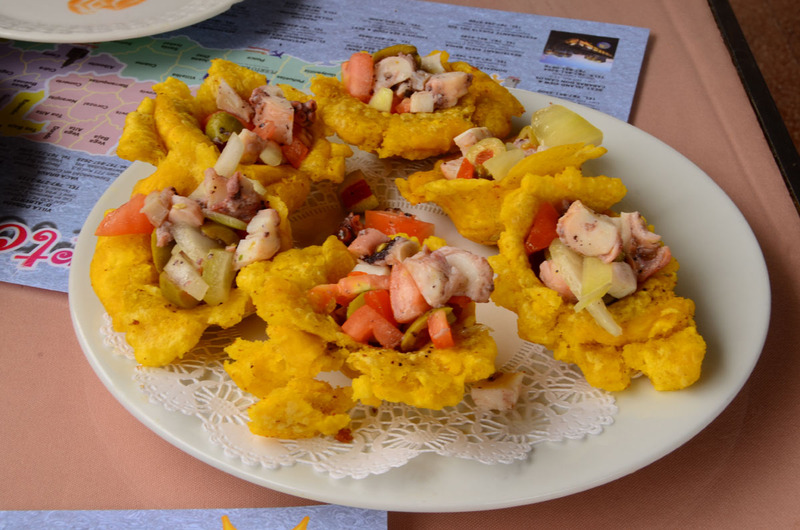 For our main course we got an ensalada de pulpo (octopus salad) and a second green salad, and split the seafood between the two salad plates. Delicious and low cal! We were very full. After lunch, we made our final stop – this time to visit Pedro Pablo Rinaldi – another of our suppliers from way back! 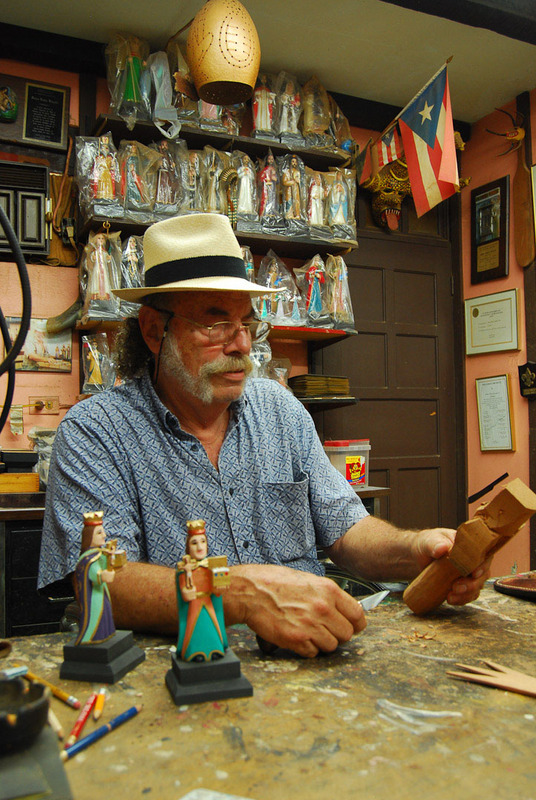 Rinaldi is a maker of santos, wood carvings of saints. He isn’t just any run of the mill carver – he is what is called a master carver, and he teaches and mentors generations of young carvers. 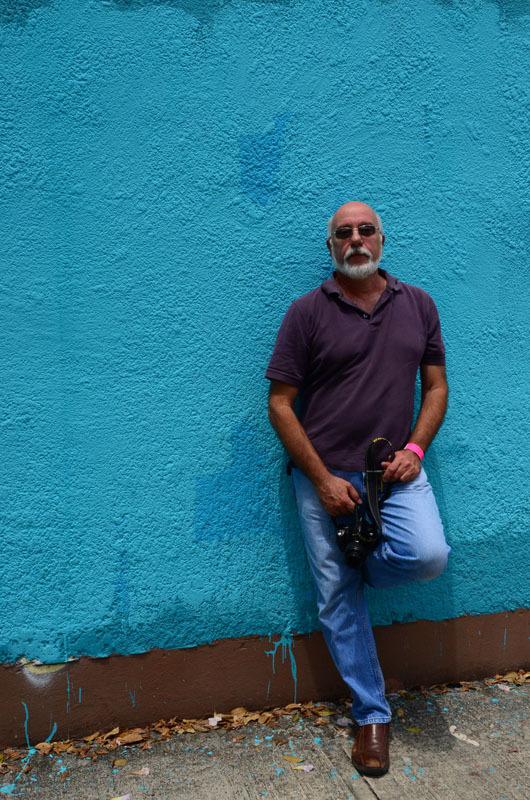 He also collects santos – and his house is like a museum. It is said that no one knows as much about the history and the craft of saint carvings than he does. Several times we heard reference to the book he is supposed to write so that all his knowledge can be shared with future generations. I hope that happens! It also surprises me that there are not PhD candidates in art history interested in this craft, who could help get the book written and photos published. Mariem, Pablo’s wife, also used to be a supplier for Isla, but in the last few years she has given up her painting because of a mysterious malady. Only recently have the doctors discovered what is wrong, and finally, with surgery, she can see relief in sight. Both Mariem and Pablo took us for a tour of their house. What a place! Downstairs they have their working rooms – offices and shop space. There is also a little kitchen and a living room-like room, I suppose for entertaining visitors (as opposed to guests). Upstairs is where they live – here is the working kitchen with an ancient range. A huge cast iron monster that is over 100 years old. Here too is their real living room and dining room. The furniture, as well as the decoration (collections of art and crafts like you haven’t seen before), is unusual and different. Each piece has a wonderful story. Pablo and Mariem also have caged birds – must be a Ponce thing. I don’t know anyone is San Juan who raises birds. I was even given a freshly laid egg to bring home with me! By this time it was almost 4 pm so we headed back to San Juan. It was a successful trip, full of nice people, old friends, good food, and new things to learn!